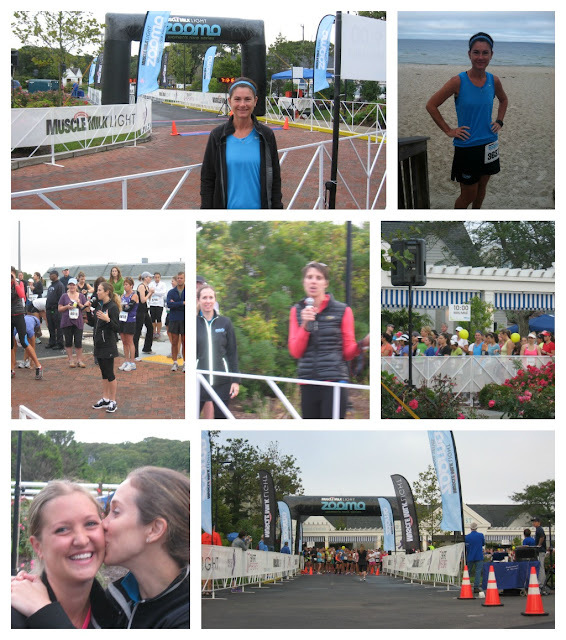 Last weekend I ran the ZOOMA Cape Cod Half Marathon in North Falmouth, MA. I had been looking forward to this race since June when I found out that I would serve as an Ambassador. I didn't get to attend the training kick-off in Boston, so I was excited to get to finally spend some time with the rest of the race crew. On Friday, my husband picked me up after my last class so that we could beat the traffic to the Cape. We stopped for a quick lunch and arrived easily in North Falmouth just after 3:30. 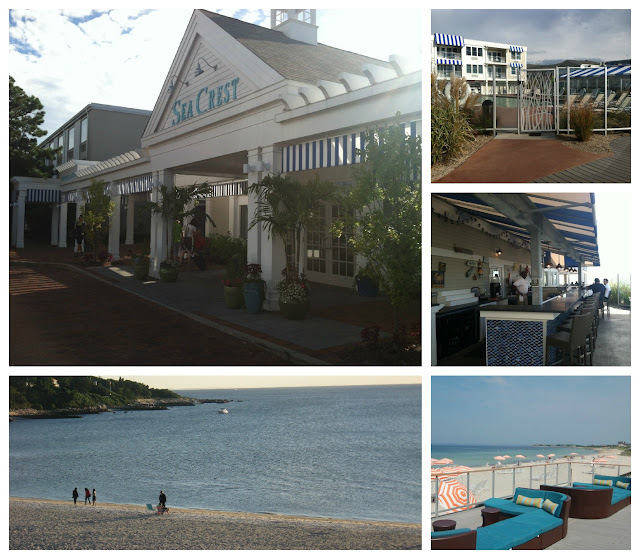 The Sea Crest Beach Resort, the host hotel and location for all of the weekend race events, was gorgeous. We took a walk around after checking in to get a peak at the pool, patio, beach access, restaurant, and courtyard. After touring the resort, we headed to ZOOMA Marketplace to pick up my race packet and check out the vendor booths. Similar to the Cox Rhode Races Half Marathon, this was a small expo, but the BIG difference was the interactions. Tricia, ZOOMA's social media director, immediately greeted me and helped me get checked in. Then I met Dimity of Another Mother Runner, and immediately loved her positive energy. While talking to Dimity I also met Heather, who has read my blog at least once (thanks Heather), and lives in the town next to me! After making a couple of purchases we made our way to sit in on the presentation by the team behind Another Mother Runner, but not before meeting Brae, one of the founders of the ZOOMA Women's Race Series. Sarah and Dimity shared tips on preparing for your race, how to get the best race photo, and recovery. Then Brae walked us through the course and pointed out some changes. Runners stood or sat comfortably on the floor during this cozy and intimate chat. We made our way to dinner at Red's located right inside the resort after a quick room change because of a small problem (great customer service by the resort staff!). We started with the yummy Local and Imported Artisanal Cheeses spread. I ordered the delicious carb-loading Brick Oven Pizza and my husband chose the huge Big Red burger. 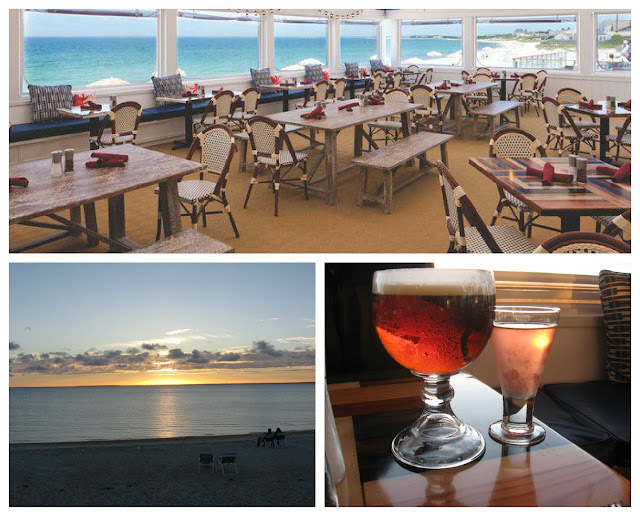 The three season dining porch gave us great views of the approaching sunset over Old Silver Beach on Buzzards Bay and was perfectly comfy. The Mocktail Party sponsored by Hint Water was set up on the Sunset Pool Deck overlooking Old Silver Beach and we met up with the other Ambassadors on the big blue lounging chairs. I got to meet Felice, Michelle, and Bethany for the first time IRL and see Nancy who I met at the Boston Saucony Party back in April. We had a great time chatting about our families, running, and packing tips. 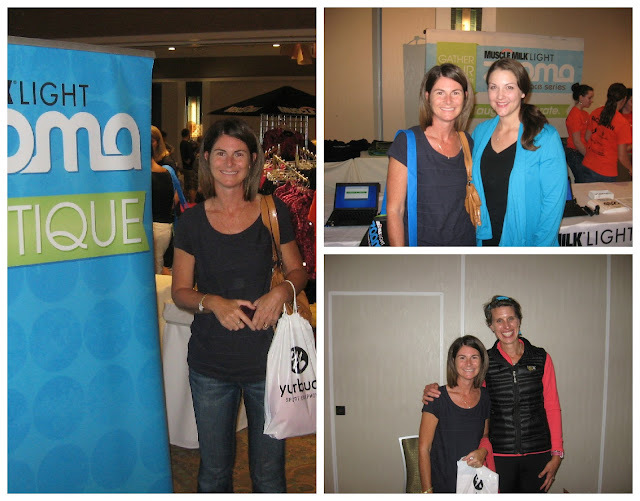 We also had a chance to meet Brooke, the other founder of ZOOMA. Race morning arrived, but there was no stress since this race started literally steps from the resort entrance. Thanks to my husband for remembering to bring our toaster from home, I was able to have my normal pre-race breakfast of PB&J toast with a cup of coffee. On our way to the start, we ran into Felice in the elevator and then I spotted Sandra, another NH runner, who I have been trying to meet IRL but we've kept missing each other. Outside the organizers had music playing and were getting runners pumped up for the start. My goal for this half was to finish in 2:10. My legs were still feeling the miles from last weekend and so was my sleep-deprived body. I read somewhere that it takes about 8 days to fully recover from RTB. Well, here I was on day 8 running a half marathon! I made a rest room stop at about mile 3 and felt pretty good until the hills came. My legs were just not in the mood for hills. I ran again with the Rock My Run playlists, and it helped a little to keep my mind off the climbs. I got a couple of bursts of energy from runner Joan, an Ohio girl from DC who ran with me for a couple of miles, and Nancy, who was working the ZOOMA Ambassador Aide Station around mile 10.5. When we turned the corner to head back up Quaker Road my gas tank was near empty. All week I'd been struggling with a lack of appetite and I think it caught up to me on this run. I took a walk break and caught this pretty picture of Buzzards Bay. The rest of the race was a mixture of feeling like crap and being determined to finish with my head up. One final mental zapper was a short jaunt we had to take on a side street just after mile 12...but I knew that this was one of the course adjustments to allow for an awesome finish in front of the resort. As I neared the finish, I was giving all that I had left in me when I saw Dimity cheering. Then I heard the announcer say my name and saw my husband waiting. 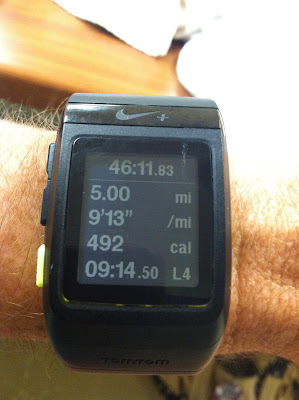 Somehow I pulled out a 2:08 finish according to my Nike+ GPS (my official ZOOMA race time said 2:10?). I had some water, a banana, and some Muscle Milk and then we walked to the Sunset Courtyard to enjoy the ZOOMA After-Race Party & Expo. ZOOMA thought of everything: massages, chiropractic adjustments, foam rollers, instant results look-up, food, wine and live music by Mighty Groove. It wasn't until we got home, that I recognized some of the notable differences this race offers. First the finisher's medal. It's not one that your going to hang on your display rack and forget about. This one is going to hang from your neck so you can show it off all day long! 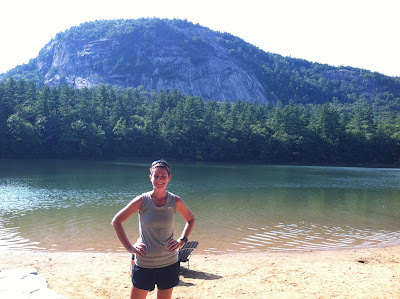 This running adventure ranks on the top of my favorite's list. If you have the chance to run a ZOOMA event, do it. You will have a blast. The ZOOMA ladies will make sure of it! Have you run a ZOOMA yet? What did you think? 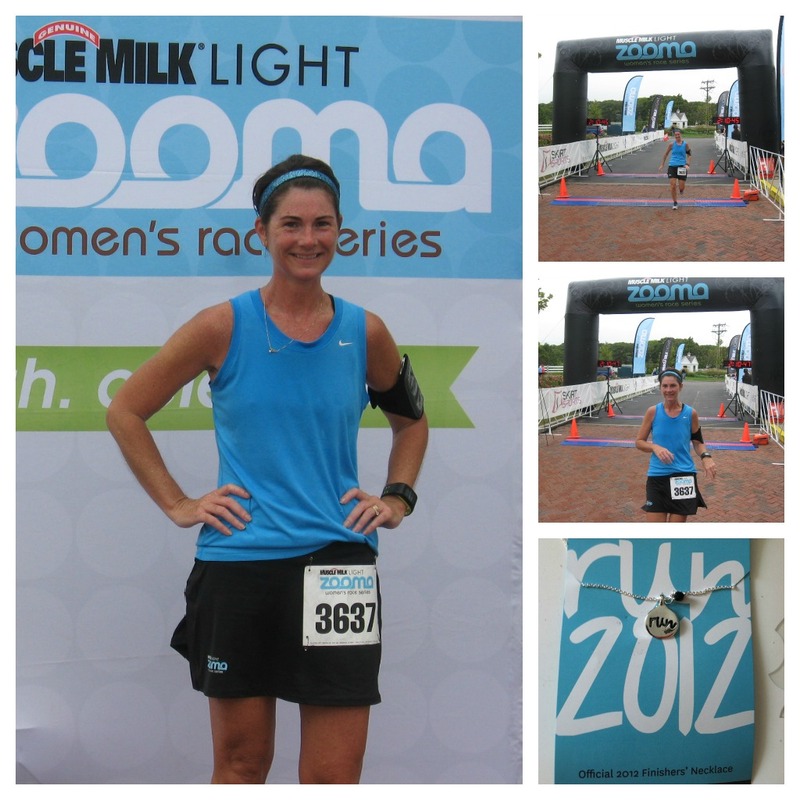 Are you planning to run a ZOOMA event? Which one? 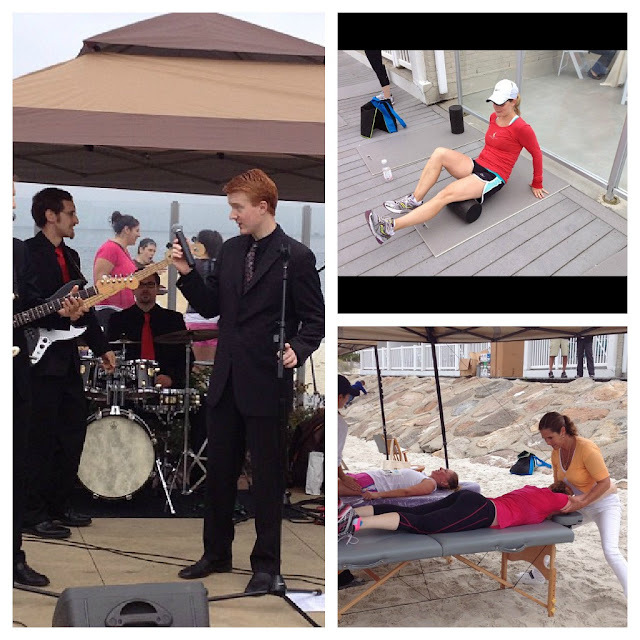 The past week was a whirlwind of amazing events: a quick Reach The Beach recovery run, a film premier and run with the legendary first-ever women's Olympic marathon champion, and the ZOOMA Cape Cod Half Marathon. I'm looking forward to a quiet week of running just for fun! #TrainingTruth: Recovery runs should be slow and easy. Amazingly, my legs were feeling pretty good on this run. I didn't have any soreness after Reach the Beach, but I did feel the effects of lack of sleep. 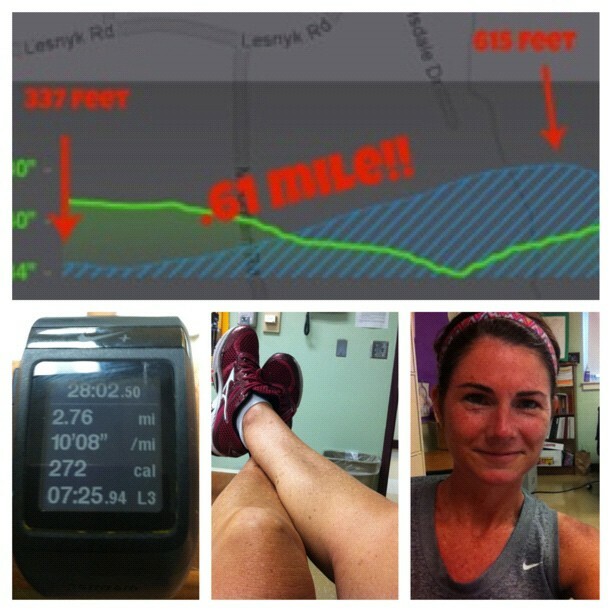 This run felt awesome and it wasn't that hard to slow down! 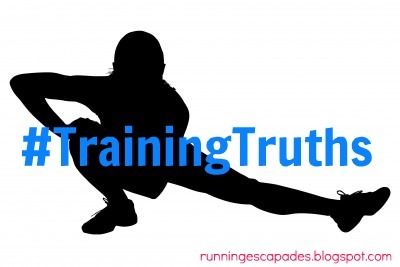 #TrainingTruth: "We are all runners" - Joan Benoit Samuelson. I love that Joan reminds us of this. So often, we judge ourselves by making comparisons to others. Joan lets us know that we don't have to run marathons or win Olympic medals to be runners. If we run, we are runners. #TrainingTruth: Something magical happens at a race run by women. Women are competitive, but in a non-threatening supportive way that men don't always show on race day. I saw first hand a level of positive energy that is contagious and extraordinary and every woman should make a point to run a women's race. The winners of the Mizuno Mezamashii Giveaway have been selected! Check the original post to see if it was you! If it was, your email has been forwarded to Mizuno and someone will be contacting you soon! Congratulations! Reach the Beach weekend finally arrived and thanks to my running partner I was invited to be a member of Team One Track Minded this year. This was definitely one of the craziest running adventures I have done yet. 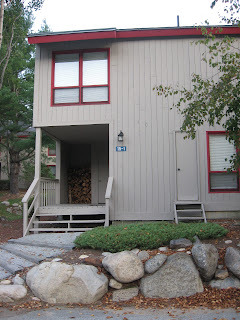 Thursday: We drove to Lincoln, NH after work to stay with the team in a teammates' condo and get organized for the Friday start. Team members who arrived earlier in the day prepared a dinner feast of chicken and pasta for all of us to enjoy. Somehow we managed to find places for 12 people to sleep in a 3BR condo! 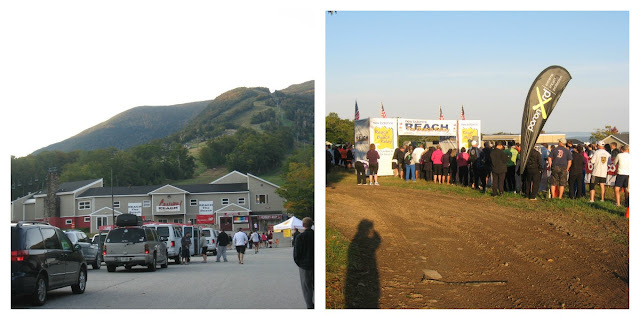 Friday: The whole team went to the start line at Cannon Mountain to send off Shana, runner #1 from Van #1, at 7:30am. It was nice to be there for the opening festivities and know that we would reach the beach early enough to enjoy the post race fun. After some shopping for some RTB merchandise, we went back to the condo to decorate Van #2, eat breakfast, clean up, load up, and head out to the first Vehicle Transition Area where our legs would begin. On the way we stopped to grab some lunch at White Mountain Bagel Co.
We arrived at Attitash Ski Area in Bartlett with plenty of time to spare and meet up with team members in Van #1. This was my first chance to see the transition areas in action. Despite the fact that there are hundreds of vans and runners, the process is pretty smooth and simple. Runners enter the transition chute and hand off the relay bracelet to the runners waiting while non-running team members stand off to the side and cheer. My first leg started around 1pm when runner #6, Joe, came into the chute and handed me the relay bracelet all curled up (so cute). It was seriously HOT and I guess I was excited because I went out on this 7.31 leg fast and ended up struggling the last couple of miles. I was lucky enough to be able to cool off at Echo Lake in North Conway afterward. It was gorgeous and felt amazing. 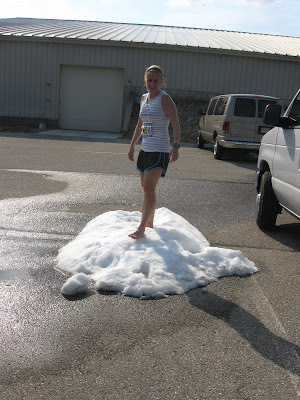 My running partner cooled off after her run in the piles of snow left by the zambonies at the HAM Ice Arena in Conway. After all our runners completed their first leg (and Van #1 finally arrived, ugh), we had dinner at Kenneth Brett School (one of many fundraisers held at the transition areas along the relay) in Tamworth and then headed to the home of one teammate's in-laws' in Laconia to get some rest before our night legs began. Luckily her in-laws lived about 15 minutes from the start of the next legs. Saturday: After about 3.5 hours of sleep, we were up and ready for the next leg of night running. 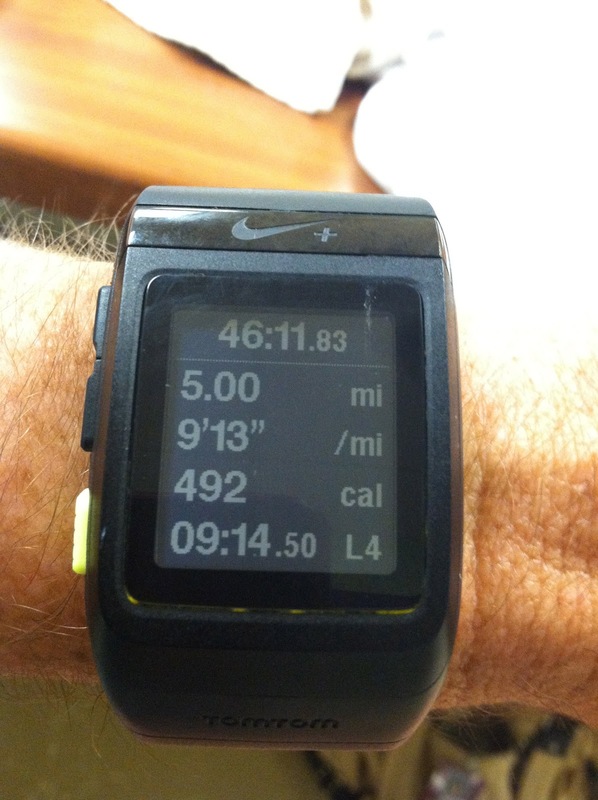 I started us off with my 4.5 mile leg at 1am from the NH Technical College in Laconia. Before this run, I had only run once at night and never in the middle of the night, but I was surprisingly calm. It was incredibly muggy and humid, and I was thankful that I changed into shorts from capris at the last minute. This time I stayed with a couple of other runners for about two miles and used my playlist from Rock My Run to pace myself after passing them. This run went much better than the first. The only scary moment was when one of my flashing lights came off, but the girl running behind me spotted it upside down in the grass. Somehow we survived all six legs without losing anyone despite going to the wrong transition area, driving right past one runner, and having two runners with stomach issues during their runs. As horrible as all this sounds, running at night was not bad at all! We drove straight to the next vehicle transition area at Sanborn Regional High School so that everyone could get some more rest before starting the last leg. 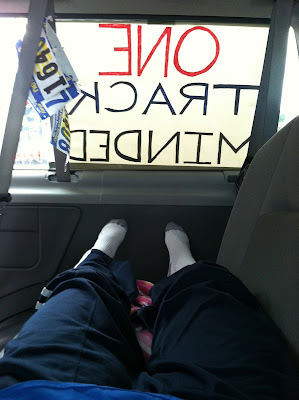 I fell asleep in the van on the way there and took another nap in the back seat while others headed outside to sleep. Thankfully I put on my Zensah compression socks right after my run. Rain had passed through earlier in the morning, but by our start time the skies had turned sunny and blue. I started off the final legs for Van #2 around noon with a short 2.4 miles to Kingston. It was warm and I went out faster than I planned, but was able to pull it off this time without burning out because it was short. The final legs went by so quickly. Before I knew it we had left our last runner and were driving to the finish line at Hampton Beach! Oh yea, anticlimactic moment...Van #2 didn't get to run across the finish line with the team because we were stuck in traffic. So the scorecard will have to suffice. Team One Track Minded. Twelve runners. 9 veterans. 3 "Virgins". Official finish time: 32:20:38. RTB was an incredible experience. 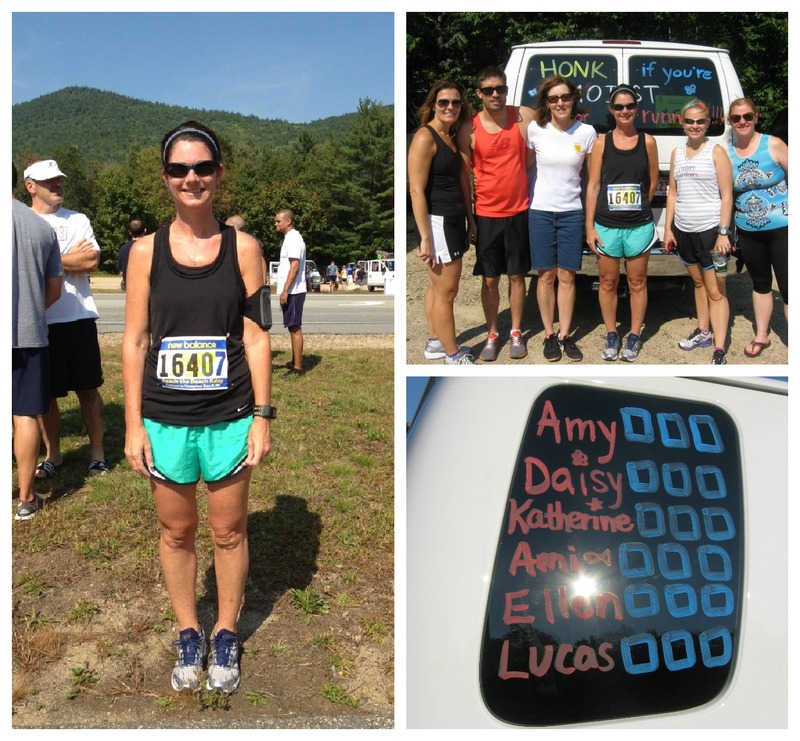 My teammates in Van #2 were so supportive, hilariously funny, and running-junkies like myself. I am extremely grateful to have had the opportunity to run with these amazing people. 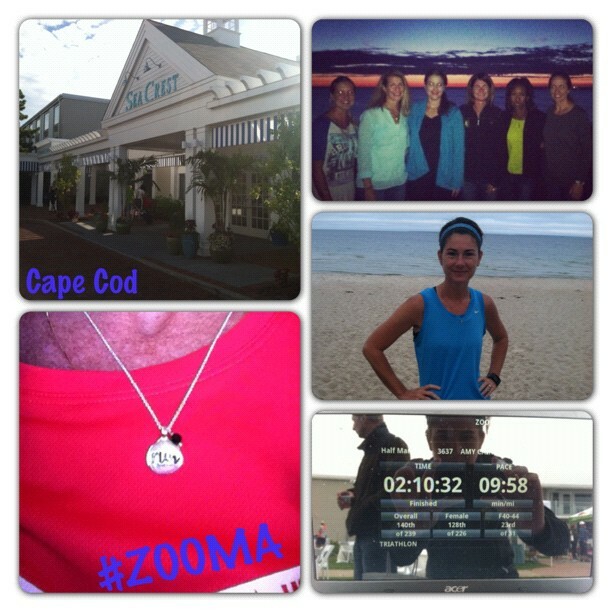 So today I am off to my next running adventure: the ZOOMA Cape Cod Half Marathon. I am really looking forward to all the amazing events and hanging out on the beach. 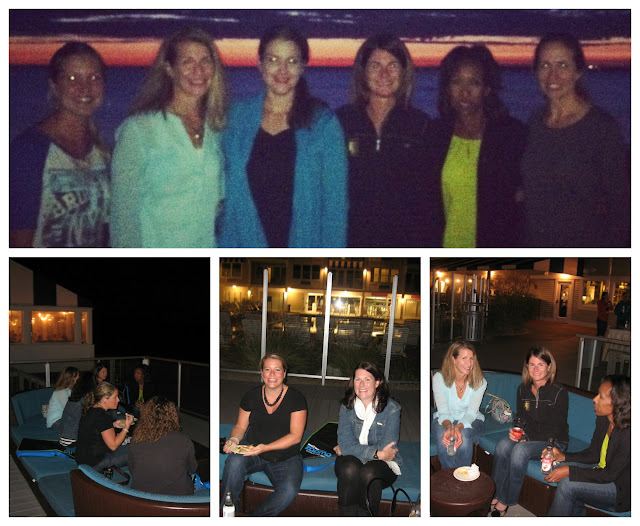 I'll be back with a recap soon, but you can follow the #ZOOMA fun on Twitter. Have you entered my Mizuno Giveaway? Today is the last day to enter. I'll post the winners on Monday. Good luck! Have you ever done a relay? What did you think? 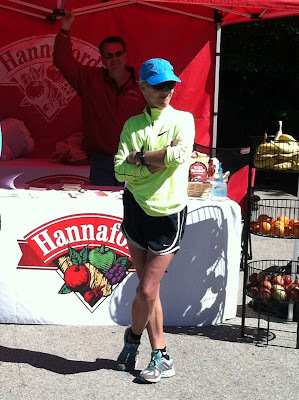 When you think of women's running, you probably think of Joan Benoit Samuelson. Joan is one of the pioneers of women's running and in fact is the first ever Olympic Champion in the women's marathon. She is a running legend, icon, hero and inspiration. When you see her run, you would wonder how this tiny woman with the unusual form could do it. She doesn't lift weights or take supplements. She doesn't even pay attention to the mile markers during a race. I think she would tell you that runners come in all different packages with all manner of strides and individual practices, but we are all runners. The fun started Tuesday evening at the Palace Theater in Manchester. 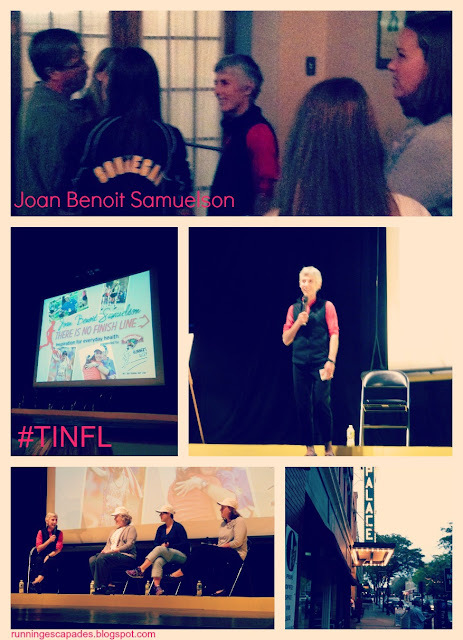 Olympic Gold Medal Marathoner Joan Benoit Samuelson presented her new documentary There Is No Finish Line. 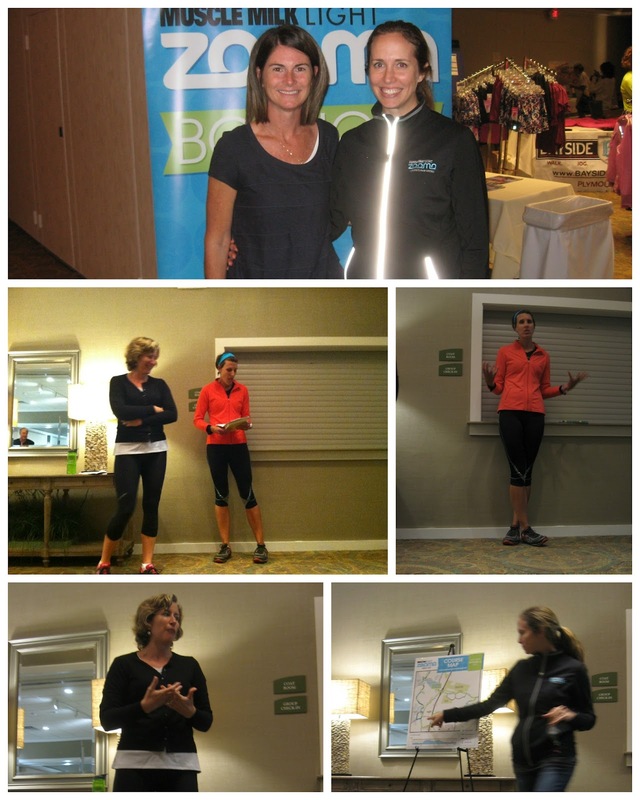 It was a night of inspiration and great stories told by Joan, people from her life, and three local runners who have used running to make major changes in their lives. In the film Joan's family and friends speak of her passion for running, her unceasing motivation to do better, and her desire to give back to the community. During the introduction and Q & A after, it was instantly apparent that Joan has a feisty sense of humor. We learn that she suffers from PMS...Pre Marathon Syndrome and gets hankry (hungry and cranky). The film also shows us how Joan's running achievements inevitably opened the door for all women in the running world today. 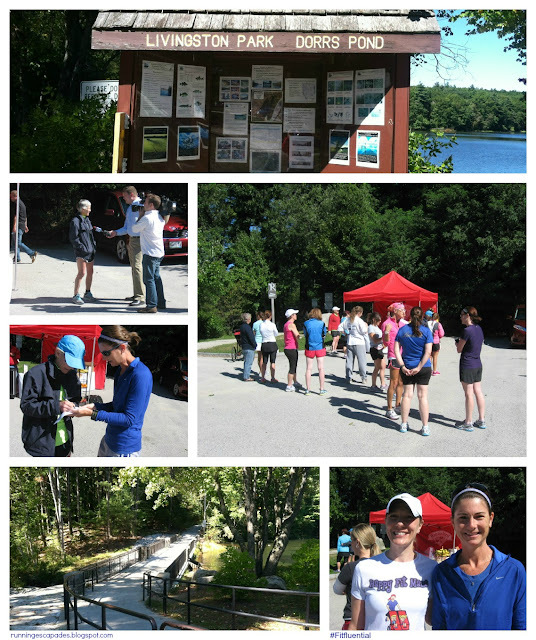 The next morning, I was lucky enough to participate in the "Run with Joanie" event at Livingston Park in Manchester. Approximately 50 people were selected to attend two sessions to discuss training, health and wellness followed by a run with Joan and her crew. When I arrived at the park, people were mingling and chatting, taking pictures and getting autographs. I found Angela (aka Happy Fit Mama) and we worked as a team to get our pictures with Joan. After a short round of introductions from everyone in the group we set off on a three mile trail run. 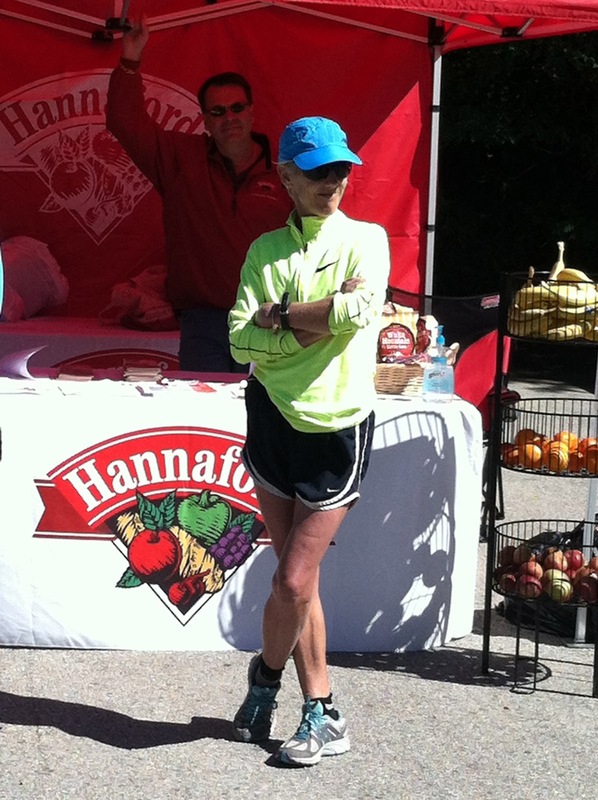 We enjoyed drinks and snacks provided by Hannaford during the post run chat with Joan. 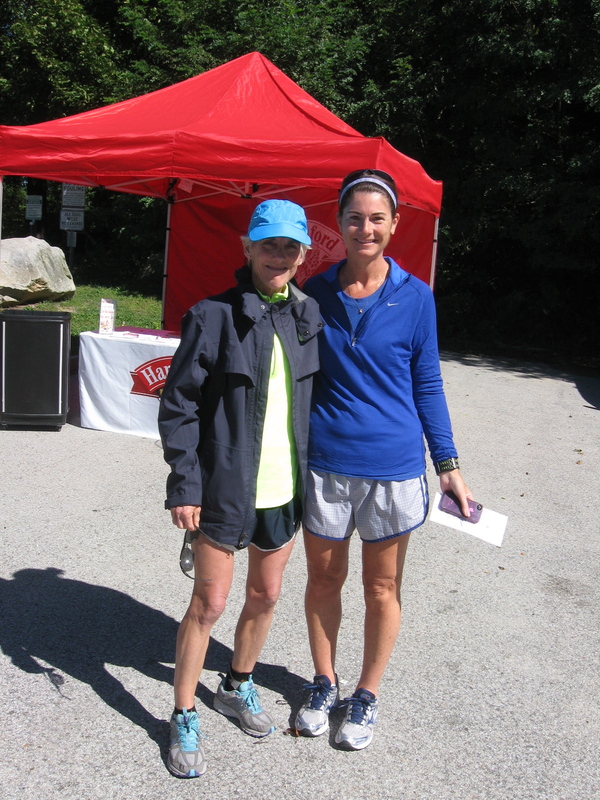 I learned from Joanie (as she is affectionately called) that we are all runners. We all carry heavy expectations that are often self imposed and habitually push ourselves beyond what we ever imagined. The most important message, of course, is that there is no finish line. Joan broke barriers in 1984 and continues to defy the odds today proving that we can still challenge ourselves in this marathon we call life. Last week was busy leading up to the Reach the Beach Relay. With my new running schedule, I was able to get in one last run before hopping into the van and heading up to Cannon Mountain where all the relay running brilliance began. A full RTB Relay recap is in the works, but today is all about my RTB lessons! #TrainingTruth: You can't fully pack for RTB until the last run is done. #TrainingTruth: Starting out too fast leads to a fizzle in the end. #TrainingTruth: Pacing can be found in other runners, music, and yourself. #TrainingTruth: It's ok to be passed by 6 other runners, if you're still running. As you can see, I never go for a run without my Mizunos. They are one of my running must haves. And you may remember from this post all the reasons why they are my go-to running shoe. There is no better feeling than not having to think about what you are going to put on your feet. Whether you run on the road, the treadmill, or the trail, Mizuno wants you to become the best runner you can be and experience the brilliance of a Mizuno run. Lucky for you, they have asked me to give away 10 Mezamashii Run Project invitations!! 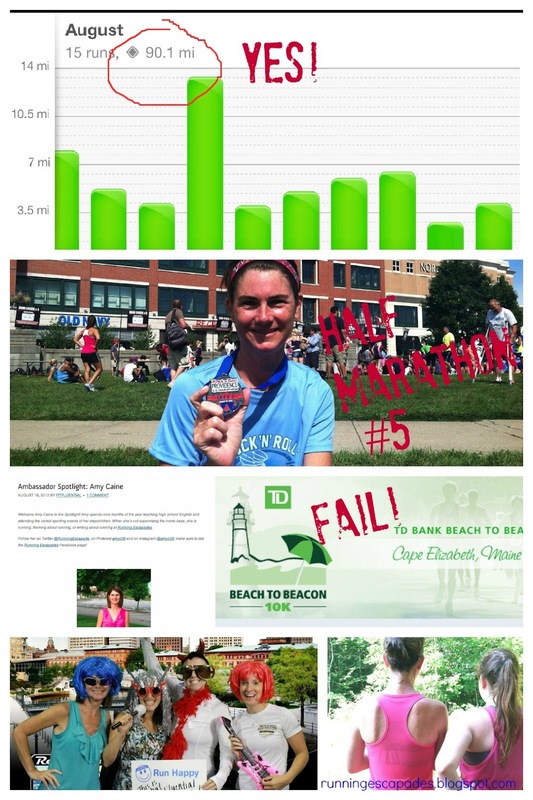 Today I am off beginning my adventure running the Reach the Beach Relay in New Hampshire. While I am very excited to be hanging out with my running partner and four other crazy runners in a van for the next 24+ hours, I am also super jazzed about some exciting events that I have coming up next week. On Tuesday I'm attending a screening of the Nike film There Is No Finish Line which documents the spirit of Joan Benoit Samuelson through her career and a Q & A session with Joan after at the Palace Theater in Manchester. Joan is an American marathon runner who won the first ever gold medal for the Women's Marathon at the 1984 Summer Olympics in Los Angeles, a two time Boston Marathon winner, and she still holds the fastest finish time for an American at the Chicago Marathon. She has also run a sub-3-hour marathon in FIVE different decades! On Wednesday, I am one of 50 lucky people who get to participate in a Run with Joanie through Livingston Park in Manchester. This event includes a 30 minute warm up and discussion, a 30 minute run, and a post-run stretch and talk. In August I was supposed to run the Beach to Beacon 10K in Cape Elizabeth, Maine in which Joan Benoit Samuelson is the founder and chair. She ran the race herself, along with icons Frank Shorter and Bill Rodgers. Unfortunately, I was unable to make it to the race at the last minute, so I am thankful to have the opportunity to attend these events and hopefully erase my feelings of disappointment for missing what looked to be an amazing race in Maine. I am optimistic that I will get another chance to run it next year. Who is the most famous runner you have ever met? Last week I went back to work as the start of another school year arrived and with this came a change to the running schedule. No more weekday morning runs for me. Luckily, my running partner and I work together so we are able to adjust rather easily. 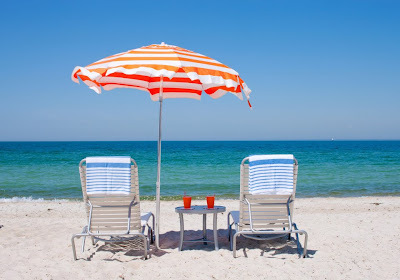 On top of getting ready for a new school year, I have been getting ready for my very first Reach the Beach. Even though I have a reasonably easy leg (running #7), my running partner has a challenging one. This means we did some hill work. 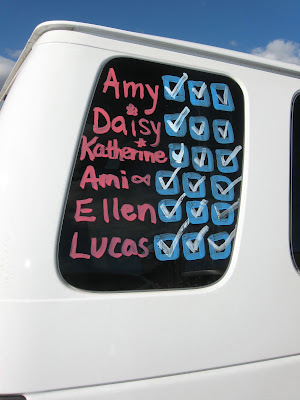 Only one more run before we head up the mountain, so it was a weekend of checking things off the RTB Runner's Checklist. #TrainingTruth: Switching to afternoon runs from morning runs really wears me out (this is the only picture I managed to get that day!). #TrainingTruth: Running up a really BIG hill helped relieve the pain in my gluteus maximus. #TrainingTruth: Every tough run feels awesome at the end. #TrainingTruth: Least favorite item on RTB packing list: sleeping bag! Yesterday was my first day back to work for the new school year and back to the after school running schedule. I find it a lot harder to run at the end of the day versus first thing in the morning, but I don't see how people can get up so dang early to run before work. ...you guessed it! My running MUST HAVEs! Today I get to announce the winners of my MUST HAVE GIVEAWAY! Please email me your mailing information so that I can get your prizes to you. Do you prefer to run before or after work? The last week of August was focused on getting ready for my first Reach The Beach Relay and enjoying the last of my weekday morning runs since school is starting this week. Although I am regretfully saying good-bye to summer, I am excited about the new running adventures I have coming up this month. #TrainingTruth: Sometimes poor fueling and pushing too hard on a run catch up to me on a humid day. #TrainingTruth: My RTB Cyclops head lamp made my first night run a success. #TrainingTruth: My legs do not like running on loose gravel roads, but they love Zensah compression socks. #TrainingTruth: Running with a BPM playlist from Rock My Run helped me maintain my pace on a solo run. Don't forget to enter my MUST HAVEs GIVEAWAY. Today is the last day. Winners will be selected randomly tomorrow!